Looking for some quick facts on the Golden Gate Bridge? If you are planning a visit or simply live in town and want to amaze your friends with local knowledge, then we have the information for you. 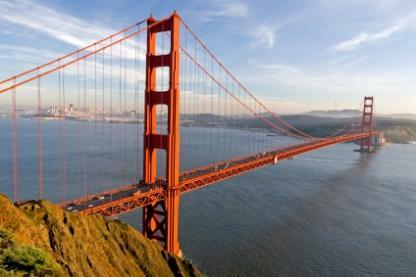 The following list of quick facts on the Golden Gate Bridge will make showing off a snap! Cram the night before your visit or simply print this page and sneak it in your back pocket. Either way, your friends and family will be thrilled with your quick wit and intelligent comments. These are a list of the most basic facts on the Golden Gate Bridge. If you only have limited time to learn a few details, these are certainly the ones to know. The Golden Gate Bridge crosses the Golden Gate, a narrow waterway that connects the Pacific Ocean to the San Francisco Bay. Cool nights and warm days generate the foggy conditions so common over the Golden Gate in the mornings. From the day it first opened until today, the Golden Gate is a toll bridge. What Kind of Bridge is the Golden Gate? The Golden Gate is a suspension bridge with large cables to support the middle hung from its tall towers.The vertical cables you see spanning the length of the bridge "suspend" the deck below them. Though cable-stayed bridges and suspension bridges look quite similar, they are different in how their cables are attached and thus, how their construction bears the weight. With cable-stayed bridges, all cables are attached to the tower(s), which in turn, bears the load. With suspension bridges, you have main cables running between the two anchorages and suspender cables spanning the length of the bridge, under constant tension. The Golden Gate Bridge has two main cables that rest above its 746-foot tall towers and end in a curve at its two opposing anchorages. From the main cables, 250 pairs of suspender cables are inserted. These cablessuspend the Bridge's roadway and help any/all weight travel evenly across the bridge. Because the suspender cables are spaced out, no one cable is under enough stress to snap free. Creating this renowned bridge was an amazing feat of engineering. 388,500 cubic yards of concrete and 117,200 tons of steel were used to manufacture the bridge's structure. Four years and $35.5 million later, the bridge was completed. The bridge measures a total of 1.7 miles long with the longest span between towers measuring 4,200 feet. It is 90 feet wide and stands 746 feet above the water. It is estimated that the actual building of the bridge included 25 million labor hours. The cables are actually 27,572 individual tiny wires spun together. More than 80,000 miles of wire were used to make the 7260 feet of cable used in the bridge. Each of the two towers is put together with 600,000 rivets. Actual paint color of the Golden Gate Bridge is Dulux International Orange. As a worst case scenario, the bridge was designed to withstand 90 mph gale-force winds, the weight of bumper to bumper traffic in both directions, tidal surges of 4.6 million square feet per second, and an 8.0 earthquake - all at the exact same time. Before this bridge connected Marin County and the city of San Francisco, the only way to cross was by ferry. Money was raised to build the bridge with a voter approved bond issue backed by Bank of America. Official ground breaking began on February 26, 1933. The Golden Gate Bridge was the first construction project to ever use the rotating drum mixer concrete trucks so common today. The production of the bridge was the first of its kind to ever use nets as safety for falling workers. These nets are now standard on any bridge project today. The bridge was designed to be a part of the beauty of the area, with slatted railings to improve passing motorists' views, special accent lighting, and the red paint to blend with the red in the hills of Marin County. The bridge officially opened for business on May 26, 1937. Strauss's company was paid a $1 million fee, but unfortunately Strauss died within a year of completing the bridge. Until 1964, it was the world's longest suspension bridge, but was then surpassed by the Verrazano Narrows Bridge, connecting Staten Island and Brooklyn in New York City. The Golden Gate Bridge continues to require labor and money for maintenance and renovations. It is one of the most widely recognized bridges in the world and a true symbol of San Francisco. Tolls are currently $5 (2008) for most cars and only collected in the southbound direction (into San Francisco). Over 1,200 suicides have occurred from jumping off the bridge. In 1994, the bridge was named one of the "Seven Wonders of the Modern World" by the American Society of Civil Engineers. The Golden Gate is awarded the second place spot, behind England's Chunnel Tunnel, on the list of the Top 10 Construction Achievements of the 20th Century. The Golden Gate Bridge is the most photographed bridge in the entire world. Two vista points, one on the south side and one on the north, give visitors a chance to see the bridge up-close. Both sites have restrooms, parking (metered on the south side and free on the north), and telescopes. The south side has a gift shop and a small museum with exhibits including a cross section of one of the cables. The Golden Gate Bridge has been featured in dozens of films, books, and television shows. Among the most popular are the films: Dirty Harry, the Love Bug movies, Superman, Raiders of the Lost Ark, and Vertigo and the TV shows: Nash Bridges, Full House, Knight Rider, and Monk.